Over at one of my favourite haunts, Serious Eats, there’s been a month-long column about the experience of going vegan for a month. In his retrospective, Kenji wrote something that really resonated with me: “Meat is safe, it’s pretty easy, even when it’s not at it’s best, it’s still edible… Vegetables on the other hand, take some planning. A bad salad is just sad”. I couldn’t agree more. The limp messes that pass for airplane salads? *shudder*. I’m not a vegetarian by any stretch of the imagination, but I do love my greens and they should be prepared such that you want to eat them, not that you feel obligated to. Growing up in Malaysia, we rarely ate salads – most of our greens were stir-fried, steamed, or boiled in soups. I used to think that raw lettuce was a barbaric concept. Who would have chosen that over a plate of oil slicked, garlic scented fried lettuce? Certainly not me, at the time. Fast forward some years later and I’ve come to truly appreciate the craft that goes into making a salad. Good salads have a range of textures and flavours that play off of each other – sweet to balance tart, crunch to balance softness, salt and pepper to bring it all together. I’m always on the hunt for interesting ways to put salads together to pull myself out of my standard spring mix/balsamic vinaigrette rut, and I found a great one to riff of on in Stephanie Izard’s Girl in the Kitchen. This is a bright, acidic and crunchy salad, a perfect respite from the hearty, rich dishes that we tend to eat a lot of in the winter. It’s also flexible – I substituted fennel for apples, and cranberries for pomegranate seeds called for in the original recipe – feel free to experiment with different proportions of ingredients. I imagine that other crisp vegetables like shaved radishes and celery would work well here too. Salads are infinitely adaptable, so go forth and play! Make this vegan by using agave nectar in place of the honey in the dressing. Supreme the grapefruit over a bowl to catch the juices. Reserve the juices and segments. In another small bowl, whisk together the olive oil, honey and grapefruit juice. Stir in a pinch of salt and fresh black pepper to taste. Cut off the fronds from the fennel and save for another use. Cut the bulb into quarters, remove the core and then cut each quarter into very thin slices. Remove any wilted outer leaves from the endives and cut into very thin slices. 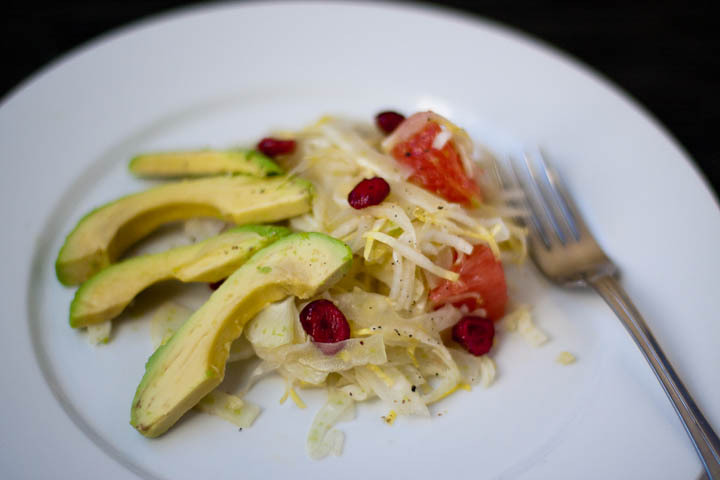 In a large bowl, gently toss the endive, fennel, grapefruit segments and dried cranberries with the dressing. Season to taste with salt and pepper. Halve the avocado and remove the pit. Scoop out the halves with a large spoon and cut each side in half again, creating quarters. Slice each quarter thinly lengthwise. Divide the salad evenly among 4 plates. 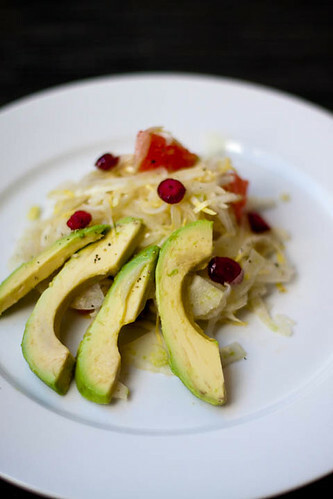 Lay the avocado slices on top, sprinkle with a few flakes of sea salt and serve. Hello, world. I’ve written far too many inaugural entries over the years as part of the detritus of abandoned blogs I’ve left littered around the internet, so I’ll keep this one brief, to wit, yay food! I love to eat, cook, and feed my friends and family (a.k.a. my guinea pigs), and I plan to use this space to chronicle my various kitchen experiments. So here we are! And to kick things off, kale, the sturdy, reliable winter vegetable. It happily takes to whatever cooking method you throw at it, and I’ve pretty much tried them all – I love it it sautéed, braised, boiled, baked – though I’ve never been particularly enamoured with raw kale. I’d had raw kale salads with a basic olive oil/acid dressing, and felt that it didn’t stand up to the chewy bitterness of the kale. It took a weekend trip to New York to change my mind. After fighting our way through crowds of people at Eataly, we made our way to the restaurant on the rooftop. Along with carafes of chicory stout, salami and cheese plates, we also had a kale salad – wispy ribbons of kale tossed with a creamy anchovy vinaigrette and grapefruit segments. It was a glorious mix of bold flavours that didn’t hold back any punches. Salty, fishy, bitter, sweet and tart happily mingled in a bowl and I couldn’t get enough of it. I threw together my version of it for dinner AND lunch when I got back home, swapping in blood oranges for grapefruit as I had them on hand, and depleting my stash of anchovies. It looks innocuous, but this is not a meek salad. 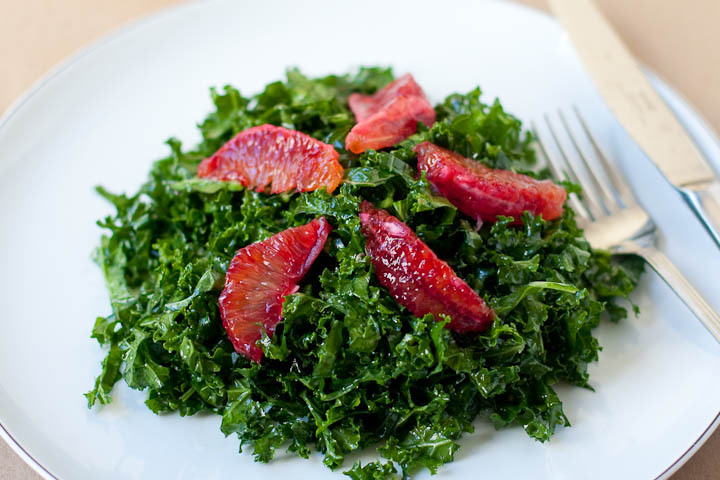 The key is to slice the kale leaves very thinly into a chiffonade, so that the dressing can thoroughly coat the kale. You can use any type of kale, but I prefer curly kale with all its nooks and crannies. Cut away the kale leaves from the thick stems. Working with small handfuls, stack the kale leaves on top of each other and roll them into a cigar shape, then slice them thinly into ribbons. You should have about 12 loosely packed cups of kale. Supreme the oranges and set aside. To do this, slice the bottom and top off the orange so that it can stand flat on a cutting board. Using a paring knife, cut the peel away from the fruit, following the curvature of the orange. Then carefully slice in between the membrane of each orange segment to release individual pieces. (If you’ve never done this before, I find watching a video of this incredibly helpful). Chop the anchovies and garlic finely and then use a mortar and pestle to mash them together. Stir in the lemon juice, pinch of salt and red pepper flakes. Drizzle in the olive oil and whisk to make an emulsion. You can do this in a food processor or spice grinder as well. 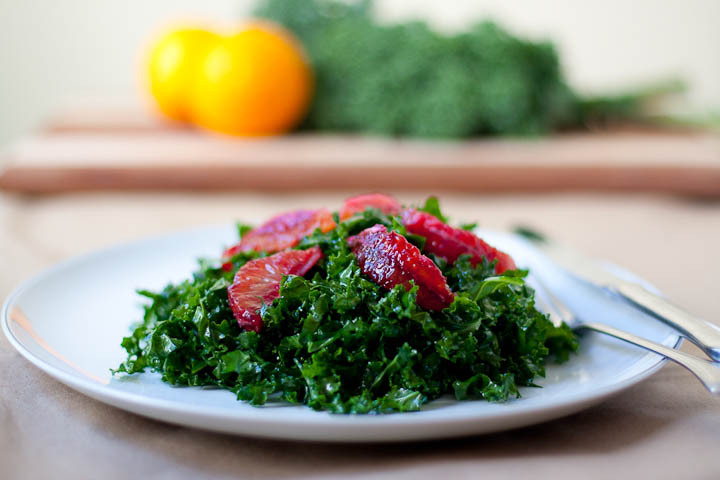 Place the kale in a large shallow bowl and pour about 3/4 of the dressing over it. Mix the dressing thoroughly into the kale – I like using my hands to massage and coat the kale. Let stand for at least 30 minutes. The kale will soften and relax as it absorbs the dressing. After 30 minutes, taste the kale and add the remaining dressing and/or more lemon juice if you wish. Turn the kale out onto individual plates and arrange the orange slices over the top. Serves 4 as an appetizer, though if you’re a kale fiend like me you will demolish half a batch for lunch. It’s a great make-ahead dish and will keep for a couple of days in the fridge.